Copenhagen is Scandinavia’s largest and most lively city and one of Europe’s most romantic capitals with its old castles and churches and charming squares and harbours. The morning sightseeing tour will acquaint us with all the city’s treasures: the Little Mermaid guarding the port, the Royal Castle, Nyhavn with its restaurants and small boats and the City Hall Square. In the afternoon we embark on the DFDS Seaways overnight ferry bound for Oslo. The ferry offers a wide choice of restaurants, bars, shops and much more. Dinner on-board. This morning takes us further into the breath-taking Norwegian nature. We cross the splendid Hardanger fjord, by travelling across Hardanger Bridge which has one of the longest suspension bridge spans in the world. On the other side of the bridge we pass Nordheimsund and crossing birch forests we arrive to Bergen – known as the capital of the fjords. Situated on a peninsula surrounded by 7 mountains the history of Bergen is closely connected with the sea and this is very noticeable in the city, especially at the city’s picturesque waterfront. The afternoon sightseeing tour introduces us to this remarkable Hanseatic city with the Bryggen area of old wooden houses, the traditional Fish Market and the city centre with the St. Mary’s Church and Haakon’s Hall. We check-in at Hotel Scandic Oernen**** or similar. Today we continue through the fjord region with its formidable water-drowned glacial valleys, flanked bycross the Naroyfjord and reach the village of Flam. Here is offered an optional tour – Flam Railway: one of the most famous and most breath-taking railway journeys in the world. In the afternoon the journey continues along the Aurlandfjord. We do a photo stop at the famous Borgund Stave Church before we continue to Fagernes. Check-in at Hotel Thon Scandic Valdres****or similar. Dinner at hotel. After breakfast we leave the majestic Norwegian fjords behind us and travel back towards Oslo which we reach early in the afternoon. Check in at Hotel Thon Opera**** or similar. 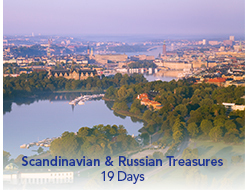 Founded in 1048 Oslo is Scandinavia’s oldest capital and today it is a very pleasant and casual city with an interesting jumble of historical and modern architecture. Upon arrival in Oslo we start the morning sightseeing tour. We enjoy a walk around the Frogner Park decorated with the unique sculptures of Gustav Vigeland. We pass by the City Hall and the main street, Karl Johan, leading to the Royal Palace. The morning is reserved for exploring more of the Finish capital individually. The afternoon offers an optional excursion to Seurasaari Open-Air Museum, an oasis in the midst of the city with cottages, farmsteads and manors from all around Finland. St. Petersburg is an amazing city. Its imperial palaces and museums enjoy worldwide fame, while the Neva River and the many canals have deservedly given the city the title of Venice of the North”. During the morning sightseeing tour we get acquainted with all the splendours of the city: the Peter-Paul Fortress, the Winter Palace, St. Isaac’s Cathedral, the Church of the Bleeding Savior, the Nevsky Convent and much more. The afternoon offers an optional excursion to Zarskoye Selo with the impressive Catherine’s Palace and the Amber Room, which vanished during World War II and was restored for St. Petersburg’s tri-centennial celebrations. In the evening enjoy an optional visit to the Nikolaevsky Palace with an exciting Russian folklore show and Russian „champagne” and snacks. The morning is reserved for an optional visit to Peterhof, an uncontested masterpiece of the time of Peter the Great, with the impressive Grand Palace, Grand Cascade and Water Avenue and its wonderful parks. In the afternoon, an optional visit to the worldfamous Hermitage Art Museum is offered. In the evening enjoy an optional Russian dinner at Restaurant Pryanosti & Radosti. The early morning is reserved for an optional St. Petersburg channel cruise. Around noon we go to the Moscow Railway Station and board the Sapsan highspeed train bound for Moscow. The train ride takes us through endless Russian landscapes along the River Volga. In the late afternoon we arrive to Moscow and check in at Hotel Park Inn Sadu**** or similar. Moscow, The Mother of Russia, is a genuine Russian city with the Kremlin and its onion domed cathedrals. The dramatic changes over the last decade have made the city to one of the most dynamic metropolis in the world. The morning sightseeing tour includes all the highlights of the vast city: the Red Square with Kremlin, the Theatre Square with Bolshoi Theatre, and Sparrow Hills with Moscow University and Kremlin grounds with a visit to one of the cathedrals. In the afternoon is offered an optional visit to the Moscow Metro including the historical stations on the Ring-Line and a guided stroll along the famous pedestrian Arbat Street. The evening offers an optional Moscowby-night tour including an unforgettable river cruise with the White Flotilla.